One of the advantages of buying a fund like an investment trust is that it offers a diversified exposure, but recent analysis suggests a large number of managers like to maintain a relatively concentrated portfolio. A concentrated approach is likely to lead to more volatile returns relative to the benchmark, especially over shorter time periods. This is because these types of funds typically have a higher ‘active share’, which refers to the percentage of the portfolio that is different to the benchmark. What sort of numbers are we talking about? Research by trade body AIC (Association of Investment Companies) found a third of investment trusts operating in the different equity sectors had 50 or fewer stocks in their fund. The practice is particularly prevalent in the UK Equity Income and Global sectors with the examples including: Finsbury Growth & Income (FGT), The Merchants Trust (MRCH) and EP Global Opportunities (EPG). What's the appeal of concentrated portfolios? Investors who buy these types of funds can be sure they are getting true active management and are not being overcharged for a closet tracker. They are getting the manager’s highest conviction ideas and the opportunity to substantially outperform the market. 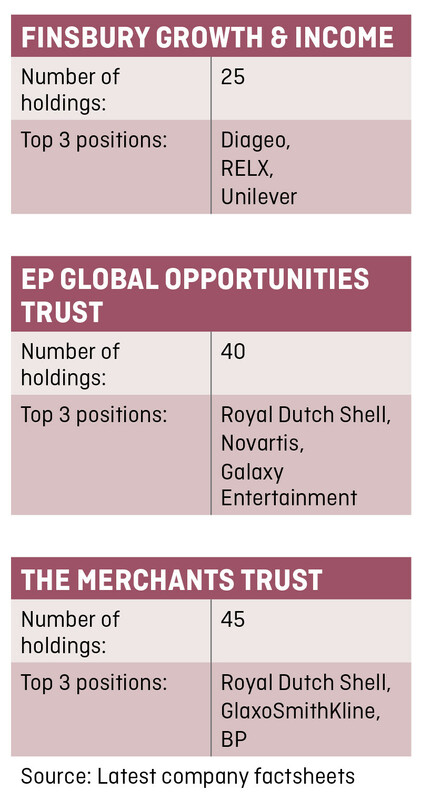 Simon Gergel, the manager of The Merchants Trust, says his team undertakes a significant amount of background research into the companies being considered for the portfolio. ‘We are seeking situations where our assessment of the investment case is markedly superior to that which is discounted by the stock market. Having conviction allows us to concentrate the portfolio into these ideas without a tail of lower conviction holdings diluting the longer term returns,’ he says. He uses a fundamentally driven, bottom up investment approach and accepts the active stock selection strategy won’t outperform the market all the time, but is confident it will work over the long-term. Steve Davies, the manager of Jupiter UK Growth Trust (JUKG), says his portfolio typically has around 35 holdings. These consist of a mixture of growth and recovery stocks with each of the shares falling into one of four themes: UK banks, UK domestic, global brands and travel, and ‘the connected world’. Traditional portfolio theory says the more assets in your portfolio, the lower the overall level of risk because the gains in one area will offset losses in another. This has been challenged by legendary investors like Peter Lynch and Warren Buffett who think that portfolio concentration reduces risk as it allows you to focus on the businesses you really understand. Gergel says the risk of underperforming the benchmark is higher with a concentrated portfolio, but it allows a sharper and more detailed focus on each investment. When a manager only invests in a relatively small number of stocks it is essential that they carry out sufficient research so they can be confident the portfolio will deliver decent returns and is unlikely to suffer a sharp sell-off. With recovery stocks, Davies at Jupiter looks for a catalyst that will turn things around and models the future profit forecasts to identify instances where his projections are substantially different to the consensus forecasts. For growth stocks, he runs a monthly screen to identify companies with long-term sustainable growth characteristics and sufficiently predictable revenues that allow him to build detailed financial models. ‘For both types of stock, meeting management is a key part of assessing a potential investment and the associated risks, and I will usually meet with a company before undertaking detailed modelling work,’ he says. There is no evidence that running a concentrated portfolio automatically guarantees better returns, but it makes you more dependent on the skill of the manager as bad selections could really hurt the performance. ‘When constructing the portfolio we pay close attention to the risks in each stock, including: operational risk, concerned with the business dynamics; financial risk, regarding the level of debt and strength of cash flow; and valuation risk, reflecting whether the shares could be vulnerable to a de-rating,’ says Gergel at The Merchants Trust.